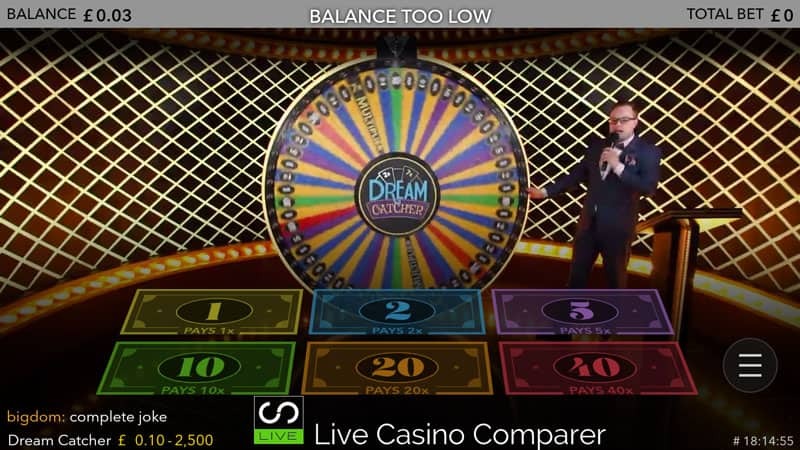 Evolution Dream Catcher is a new Live Casino game. I say new because although this version of the game is brand new, the concept of Wheel of Fortunes has been out for years in land based casinos. 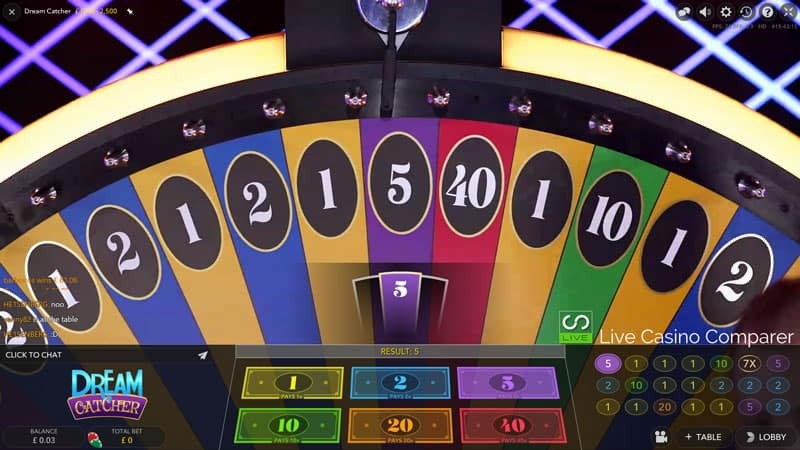 Wheels of Fortune are based on a simpler form of a roulette wheel. There are many different types of wheel, the most popular being the “Big 6” which the Evolution Dream Catcher is based on. If you play in land-based casinos you’ll normally find Wheels placed strategically near the cashiers’ desk. The casino is hoping to tempt people with their last few chips for one or two spins of the wheel before they leave. The wheel of fortune entered mainstream popularity when Merv Griffen, a TV producer, introduced one in the TV show “The Wheel of Fortune” in the 1970’s. The Evolution Gaming version is not the first live version. 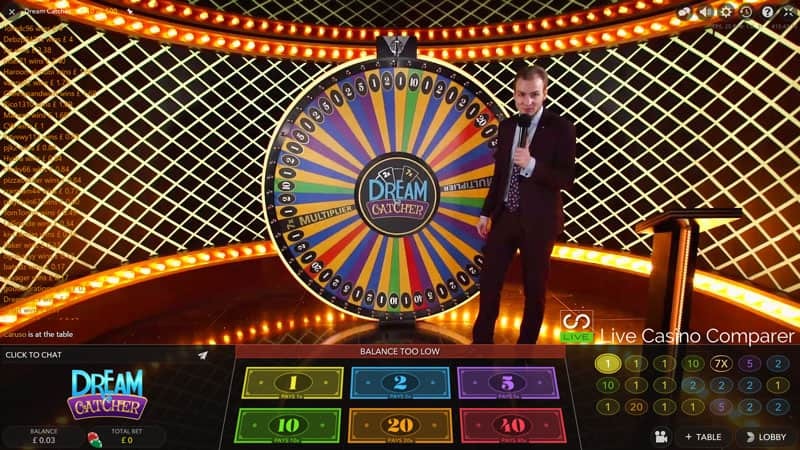 Betgames have a live Wheel of Fortune, but Evolution’s version has a number of unique differences that make the payout structure more appetising for adrenalin junkies. Roll forward to 2017 and Evolution have evolved the game further to attract a new audience to live casino games and perhaps provide a crossover game for slots players who love the big wins. The wheel has 54 equal segments. 52 of the segments are marked with a number (1, 2, 5, 10, 20 & 40). 2 of the segments are marked with a multiplier symbol (2x & 7x). You bet on the number you think the wheel will stop at. Each of the numbers has a different payout value. It’s easy to remember as the payouts are the same as the number value. 1 pays out your stake x 1, 5 pays out your stake x 5 etc. If the wheel lands on the multiplier symbol then all bets remain and the wheel is spun again until it stops on a number. That payout is then multiplied by the multiplier. eg if the multiplier is 7x and then wheel then lands on 5 you get your stake x 5 x 7. (35 x payout). 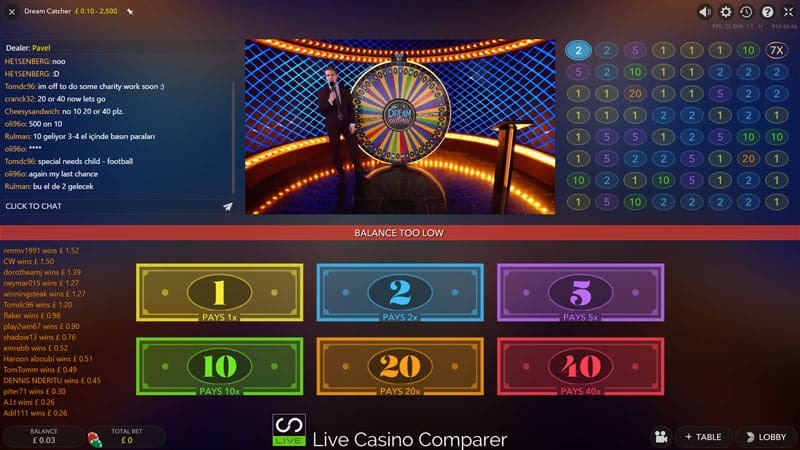 Each number has a different payout and frequency that it appears on the wheel. Number 1 (Yellow) occupies 23 segments. Number 2 (Blue) occupies 15 segments. Number 5 (Purple) occupies 7 segments. Number 10 (Green) occupies 4 segments. Number 20 (Orange) occupies 2 segments. Number 40 (Red) occupies 1 segment. Multiplier 2x occupies 1 segment. Multiplier 7x occupies 1 segment. The RTP for Dreamcatcher is 96.58%. The playing interface has been designed so that it can be played on desktop and mobile devices. and then Classic Mode for those that have less bandwidth or want to see more of the previous results and more of the chat. The results are displayed in close-up and are confirmed when the winning number is displayed on the interface. 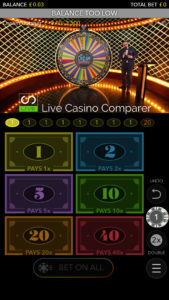 The last results are displayed on the right-hand side of the screen and show the last 21 spins. Mobile Players can play in either portrait or landscape modes. Rotating the screen changes the viewing mode. Dream Catcher is certainly a niche game and aimed squarely as a crossover product for players who haven’t played Live Games before. I don’t think the game is suitable for Slot players. While it is simple in its concept, like slots, there isn’t the excitement generated like when you trigger a bonus round. In slots you know you’re going to get something when that happens, it’s just a case of how much. But with Evolution Dream catcher even if the 7x multiplier is active you still have to get a winning number to receive a payout. Perhaps we will see the game evolve further as at the moment I fear it won’t survive that long. In the short term though the presenters really make the game. Evolution has recruited well. They keep the interest in the game going and generate excitement even when it’s not there.